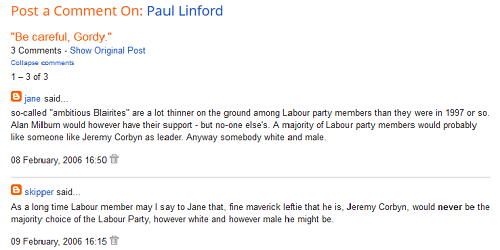 Corbyn's leadership predicted on this blog in 2006! Looking back over some old blog posts today, I came across this gem from 2006. A propos of a discussion of who might succeed Tony Blair and whether Alan Milburn might put up as a challenger to Gordon Brown, the former Reading MP Jane Griffiths appears to predict Jeremy Corbyn's leadership of the party. Former politics professor Bill Jones, who blogged as Skipper, was less than impressed by the suggestion! The original blog post is here.